This week's favorites are books that were tearjerkers. This book just completely changed me and my view on life. I was in a really dark place when I read it and it made me realize if I were to make a very permanent decision, it would greatly impact the people I love in a very horrible way, which is definitely not what I wanted to happen. Asher's writing is incredibly raw and so believable, I could not put it down once I started, a must read! The writing in this book in incredible, I just couldn't help but get sucked into Mia's story. The whole book had me a little on edge with all my emotions, but that ending, oh my goodness I lost it. I really need to read Where She Went and Just One Day by Forman, I've heard amazing things about both! This book has such a unique and touchy topic- a brother and sister who fall in love. I know you immediately think 'eww' but it's these two stories that Suzuma portrays so well that has you rooting for them in the end. Just the beauty of their love story and the sadness of what keeps them apart is what got me tearing up, oh and the ending. A beautiful novel that is incredibly told that made me question my beliefs, amazing. I don't want to say to much because I don't want to give anything away, but holy cow. I balled, like ugly cried my eyes out. The thing I love most about this book is that it is so, so much more than just a sad book about a girl who has cancer. It's funny, extremely witty and just so beautiful. I love it. I've yet to meet a person who cried during this one so I think it's just me. I didn't completely lose it, just some tears when a certain person died. (Don't want to give away who...) I really related to the character and thought his/her story was just beautiful. Revis' writing just had me so captivated that I was scooped up in the moment and didn't want to see this character go, but it was such a wonderful way to go. One of my favorite books and one of my all time favorite (yet torturing cliffhanger!) endings. The climax of this book was so intense and the events leading up to it had me on the edge of my seat dying to know what happened next. The last page killed and inspired me all at the same time. I love Oliver's writing and can't wait to read the final book in this trilogy. 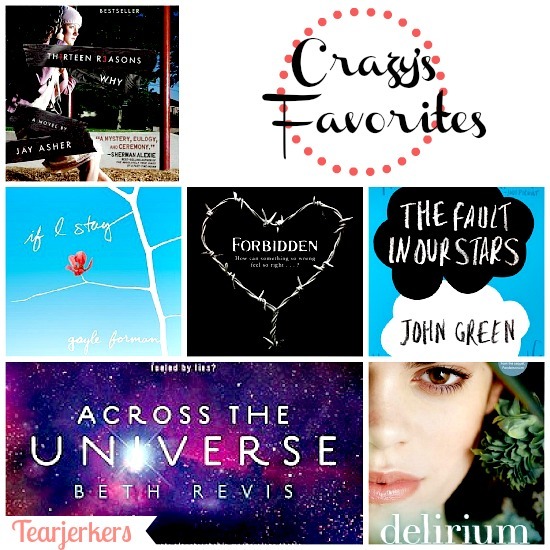 Now go grab a box of tissues and read these awesome books! What are some books that were tearjerkers for you? Ooo I haven't read anything by her, I'll definitely need to try! This is a cool thing you're doing. Makes me think I should go back through mine sometime and reflect. I'm TOTALLY curious as to who made you cry in Across the Universe. I must listen to Fault in Our Stars soon. Aw thanks Juju! You totally should, it's so awesome (at least for me) to look back on all the awesome books I've read! (Hint: He was good at painting!) I don't want to spoil it lol! The Fault In Our Stars is definitely crying book. I read it twice and cried both times. Out of all the friends that read it, only one of them didn't cry! Great picks! I am reading If I Stay at the moment but I have to say, I can't put it down! It's such a beautiful story so far, which makes me dread the end. I just don't want the book to end. I am planning on reading The Fault in Our Stars after this. But I am sure two tearjerkers in a row would do some damage to my system. Oh well! Aw that's awesome, I hope you love the ending! Can't wait to see what you think of TFiOS! There definitely worth the damage though, lol! I cried at the end of Delirium, like ugly cried. I need to read the rest of these except for If I Stay. Thanks for sharing! Delirium, Forbidden, The fault in our star, the probability of miracles and for some reason Tiger Lily, that last chapter made me weep for days. If I Stay and Delirium made me cry too! Yes, you must read Where She Went. I loved it more than If I Stay.